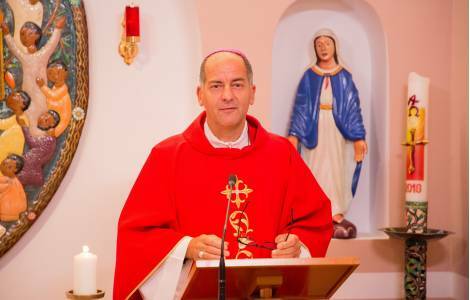 ASIA/TAIWAN - Archbishop Dal Toso: "Without testimony, the Gospel would be mute"
Taipei (Agenzia Fides) - "Gods calls us regardless of our own personal merit; God calls us to be apostles; the message that we bring is the very heart of our faith, the proclamation of the death and resurrection of Jesus". These are the three points highlighted by the President of the Pontifical Mission Societies (PMS), Archbishop Giovanni Pietro Dal Toso, during the Eucharistic celebration that he presided over on Sunday 10 February in the Holy Family church in Taipei, during the Continental Meeting of the National Directors of the PMS of Asia (see Fides, 9/2/2019). At the beginning of his homily, Mgr. Dal Toso recalled that the PMS "are a worldwide network at the service of the Holy Father to support the mission and the young Churches through prayer and charity. The PMS do not simply offer financial aid. Their task is also that of reminding all the faithful that we can sustain the mission first and foremost through our prayer and testimony of faith. This week, the National Directors of the PMS in Asia are gathered here in Taiwan to reflect on how we can better help the Churches in Asia to become missionary". Referring therefore to the biblical readings of the day and to the theme of God's call, the Archbishop emphasized that "God seeks us, because He loves us and does not consider our merits but the good projects He wants to carry out with us. This is also a great sign for a country like this. It was God’s will to come to you through the work of the missionaries, even in relatively recent times, because God desires to give His life, His forgiveness, His Holy Spirit to all". Continuing the reflection, Mgr. Dal Toso stressed that "God calls us to become apostles. God calls us to Himself to send us to others". To be apostles means "to be witnesses of our faith in our everyday life", and especially in this country, where there are few Christians, it is necessary to be witnesses of faith, "so that even today God may continue to call people to Himself, so that others may discover the mercy and the forgiveness of God, so that others may know that they have a Father who is in heaven". And he urged Christians: "Without our testimony, the Gospel would be mute. Without our testimony, the Gospel could not continue to manifest that God loves man". "In fact, this is our message, the message of which we are heralds: God loves man". Christ died for our sins; He died and rose from the dead to cancel our sins. God so loved man, that He sent His only Son to die for us. "This fact of the death and resurrection of Jesus, which we repeat every Sunday in the Creed, is the heart of the Church’s message. We also repeat it in every Eucharistic celebration, after the consecration... This is the great miracle of our faith: Jesus died and rose for us all. We celebrate this miracle in every Eucharistic celebration".